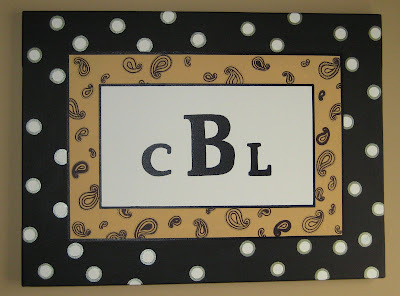 16 x 20 monogram done to match the bedding for sweet baby Caden Lee. 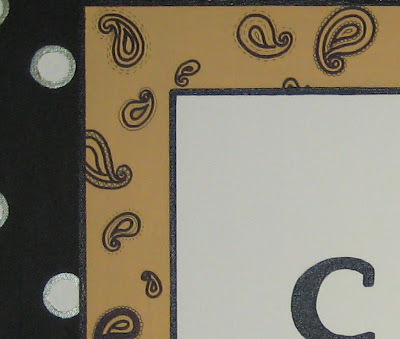 The outer border is black with creme polka dots, each outlined in a golden/bronze color. Inner border matches the wall color with black paisley all the way around. Heather, I love all of it! You are so talented. I can't wait to have you do something for me. I can work with you to create something perfect for yourself, your little one, or others you are needing a gift for. I can match your fabrics, colors and theme, or design something you have in mind! I'm a stay-at-home mom of twin boys, Ben and Drew, and wife to the best guy I've ever known. I feel blessed to be able to share each day with them, but often need an outlet for my own creativity and a break that allows me to just be...well, me. That's when I re-discovered my love of painting. 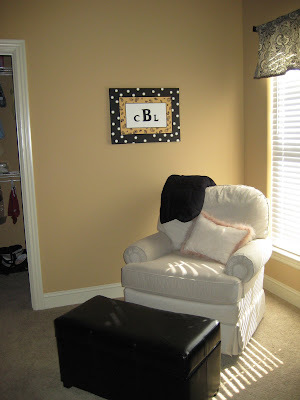 After doing a few canvases for our own boys' room, playroom, and gifts for friends, I received so much positive feedback that I decided to make it into a small business. I'd love to work with you to create that something-special that makes your room as unique and beautiful as your family deserves it to be. piddlespaints@aol.com or call me at 615.794.9404 or just leave a comment with your email address and I'll get back to you. Need the perfect gift on short notice for baby showers, birthdays or other events? Contact me at any time and I can email you pictures of canvases I have wrapped and ready for you to give!